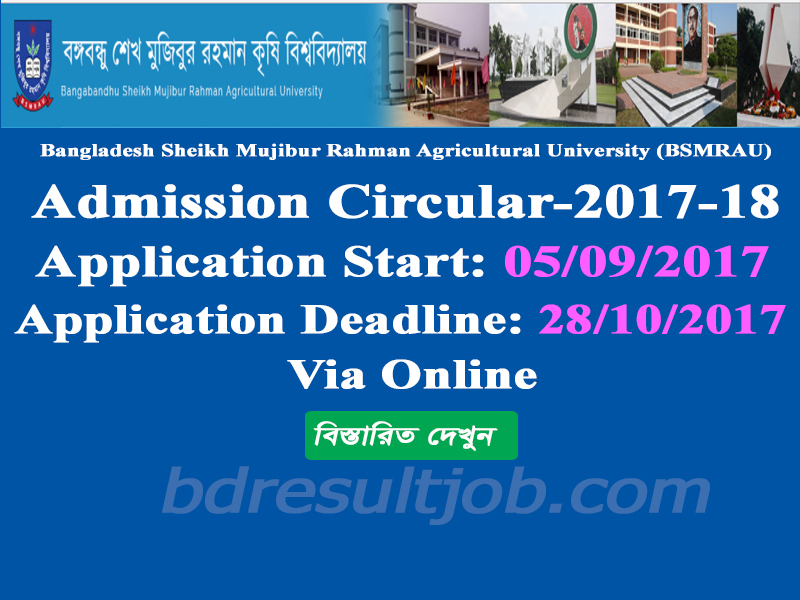 Bangabandhu Sheikh Mujibur Rahman Agricultural University (BSMRAU) Admission circular 2017-2018 has been published. 8. Admission start for merit list: 30/11/2017 at 10:00AM to 4.30PM. 9. Migration Application date:30/11/2017 at 10:00AM to 4.30PM. 16. Reported and faculty wise admission: 04/01/2018 at 10:00 AM to 4.30PM. b. SSC/Equivalent passing year 2014-2015 in science group. i. Minimum B Grad in physics, Chemistry, Mathematics, Biology and English in HSC or Equivalent level. ii. Individual Minimum GPA 3.50 in both of SSC/Equivalent and HSC/Equivalent Examination. iii. Minimum total GPA 7.50 in SSC and HSC. iv. Minimum 4 B Grade in O level Examination for O and A level passed students. v. Minimum B Grad in Physics, Chemistry, Mathematics, Biology and English in A Level. 1. Please prepare a color Photograph in jpg format less then 50kb . 2. Visit: http://bsmrau.edu.bd/ and fill up application form carefully. d. Type the Biller ID 375 for Bangladesh Sheikh Mujibur Rahm Agricultural University (BSMRAU). Selected applicant Bangabandhu Sheikh Mujibur Rahman Agricultural University (BSMRAU) admit card can download 02/11/2017 to 07/11/2017. a. Visit: http://bsmrau.edu.bd/ and select the admit card menu. b. HSC Board, Roll Number, Registration number and Login with Bill Number and DBBL Transaction ID. c. Download your admit card and print A4 size paper. 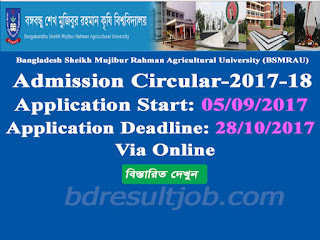 Tags: bsmrau.edu.bd, bsmrau edu bd, Bangabandhu Sheikh Mujibur Rahman Agricultural University (BSMRAU) Admission circular 2017-2018, BSMRAU Admission circular, BSMRAU Admit card download, BSMRAU seat plan, BSMRAU admisttion test mark distribuition, Bangabandhu Sheikh Mujibur Rahman Agricultural University (BSMRAU) Admission circular, Bangabandhu Sheikh Mujibur Rahman Agricultural University (BSMRAU) Admission test result. Bangladesh Education and Job Portal: Bangabandhu Sheikh Mujibur Rahman Agricultural University (BSMRAU) Admission circular 2017-2018 has been published.